North Park San Diego restaurant location, outstanding rent and great location. Bring your concept or idea to this recently completely and freshly built out restaurant. Seller has put it all together and now changed her mind about putting in the time necessary to run a successful restaurant. Her loss is your gain. North park demographics are ideal for many restaurant styles and concepts are you looking for a space that is ready to go in the North Park San Diego area? Don’t miss your chance to get in cheap and fast!. Unique kitchen design lends itself to many restaurant/café/catering possibilities. 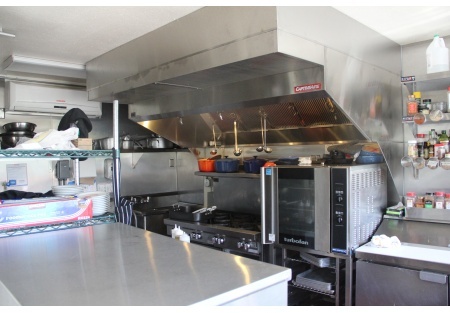 The full kitchen has new hood/exhaust system, with most other equipment in new or near new condition. Design with Kitchen fully separated from dining area will easily support breakfast/lunch, coffee/café, or many other traditional restaurant concepts. With this central location you could even throw catering into the mix for even greater revenue opportunity. Capitalize on the growing North Park area with its family atmosphere and the young and hip and moneyed crowd, all mingling happily right here in this great up and coming neighborhood. Area is heavy with foot traffic and vehicle traffic alike, location will be easy to find and is very noticeable. Rent is only $1600/month and includes trash and water. This approximately 1200 square foot space has a great dining area, separate storage area and a very nice patio area for enjoying the San Diego weather and sites. Three one year options remain on current lease with the landlord being open to doing a brand new lease with a solid new tenant. Huge nearby parking garage, up and coming neighborhood that is young, vibrant and densely populated, all ideal factors when considering the location of your restaurant. Come by today and see if this is the place you’ve been looking for.